When a mutual fund pays dividends, the nav or net asset value of the fund reduces by the amount of dividend being paid out. So indirectly it means a reduce in capital invested in the market. Some mutual funds pay the dividend once a year, some once every quarter and some pay dividend monthly. Many investors consider mutual fund dividend option as not a choice because the dividend being paid by mutual funds reduces the nav of the fund by the same amount. What it means is if NAV of a mutual fund is ₹25 and if fund declares a dividend of ₹1, the nav of the fund will become ₹24. The process is same even for stocks but often we don’t feel it the same way. When a dividend is very low like 1% or so, there is very little in the change of the stock price noticeable because any stock can move within that small range of 1% on a given day but when a company pays high dividend, the stock price adjust on the ex-dividend day similar to mutual fund. So though mutual fund dividend may look different than dividend from stocks, it isn’t. Why I prefer dividend tax saving option? Coming back to the original question which is why my personal choice is always dividend option at least for tax saving mutual funds? There are 3 primary reasons for it. Every investment has an objective. With tax saving my objective is to save the maximum amount of tax with minimum investment. Dividend helps me achieve it more efficiently. If you look at my tax saving mutual fund portfolio of last fiscal. I invested ₹1.5L in DSP BlackRock Tax Saver fund and got back ₹4166 as a dividend from the same fund. Effectively reducing my tax saving investment by the same amount and yet got the full benefit of investing ₹1.5L. I have been following the same process for few years now and has explained it in more details here sometime back. If your investment objective is to remain invested in the market, opt for growth option and not a dividend but for me, dividend option is better as it helps me achieve my investment objective with minimum investment. 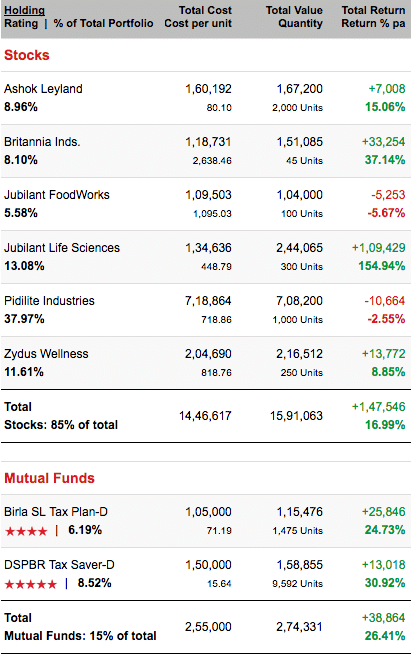 Over the long term, I am able to beat the returns from the best performing mutual funds. So it makes sense for me to be investing least in mutual funds and more in stocks. You aren’t in the market to beat the returns of the index or compete with others. As an investor, the aim should be to maximize the returns and so if you cannot do it on your own, let the mutual fund manager do it for you. I don’t like to be boasting. In fact, as of today (9th April 2017), my stock portfolio is underperforming my mutual funds’ portfolio by 10% compounded annually. So my mutual funds’ portfolio is giving returns of more than 26% and my stocks are under 17% CAGR. My stock portfolio is quite new and the mistake of Pidilite which forms a significant portion of my portfolio dampens the performance of my entire portfolio but I am sure in the long run my portfolio will outperform not only these mutual funds by a margin. Note: My stock portfolio doesn’t take into account the profits booked in Tata Steel and Infosys. Dividend received is tax-free if overall dividend received in any fiscal by an individual is less than ₹10 lakhs. My overall dividend income is still under ₹10L and so it helps me achieve my investment objective without paying taxes. As my income from dividend increase over time, I may need to relook at the strategy of investing in dividend-paying mutual funds but as of now, it is a no brainer for me to consider dividend paying tax saving funds. There is no general rule like dividend is better than growth option or vice versa but the most important aspect to look at is the your investment objective. How you can achieve the objective in the most efficient manner. 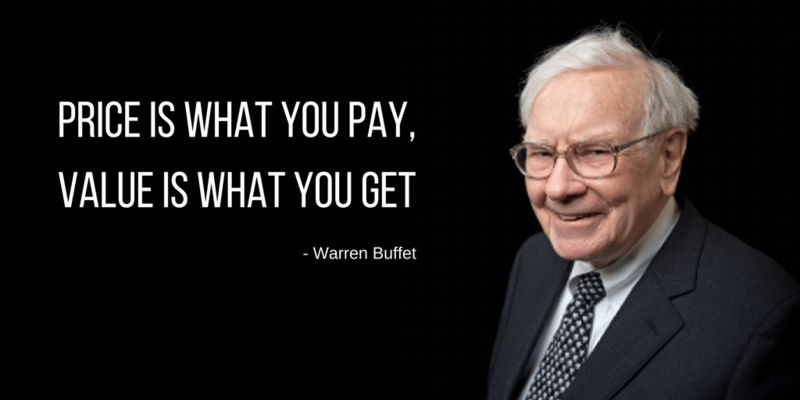 If the dividend is the right choice for it, go for it else opt for growth option. You are here: Home / Tax planning / Why I Prefer Dividend over Growth Option For Tax Saving ELSS Mutual Funds?